This exhibit, featuring photos from the collections of Hometown Heritage and the Perry Historic Preservation Commission and objects from Forest Park Museum and the GAR Museum, honors our WWI veterans and tells the story of life in Perry from 1914 - 1918. Come learn about Lucy Oscar Cassell, an African American woman who worked on the railroad during the war, V.T. Hamlin, a Perry teen who enlisted at 17, General Pershing, a famous chicken who supported the war effort, and many more! And we need your help! 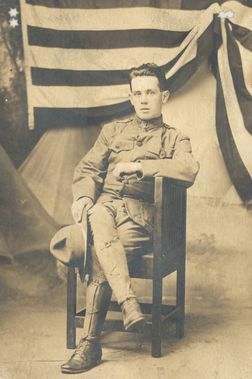 We want to fill our new exhibit walls with photos and stories about your WWI relatives. If you would like to contribute a photo or story, please contact Alissa at info@fcctrust.org or 515-465-7713. This exhibit is created with grants from the Bock Family Foundation, Dallas County Foundation, and in Partnership with Humanities Iowa.